From presidents Johnson to Obama, tens of thousands of young lives have been sacrificed for purposes ill-conceived in their design and futile in their execution. And for every American misjudgement, Australia has been lock-step in agreement.With the overthrow of Saddam Hussein’s strong-arm government, the Coalition of the Willing lifted the lid on sectarian and tribal conflicts in Iraq. Islamic State militants are motivated by hatred of the West and a desire to restore Sunni dominance over the US-sponsored Shiite government in Baghdad. It's worse than that. It was only a year ago that President Bashar al-Assad was deemed to be evil and a grave threat, and that military action against his regime was both a moral and strategic imperative. Now the US, UK and Australia are starting a new campaign to bomb those fighting against Assad – the very same side the U.S. has been arming over the last two years. (the same, of course, was true of the Taliban in Afghanistan). It was a national imperative on both occasions. 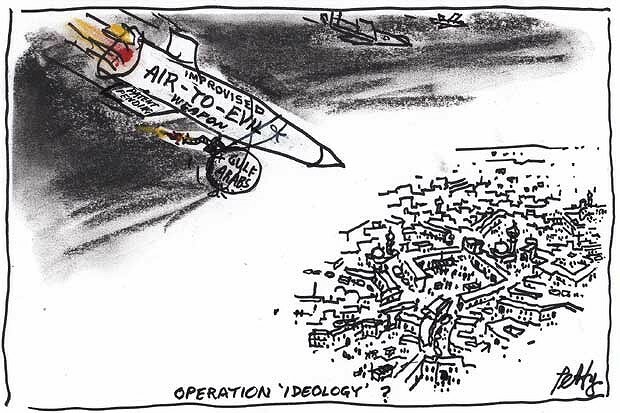 The Abbott Government is obediently following the Obama administration's script of the need to destroy ISIS. That means the “limited” bombing of Syria and Iraq to attack ISIS will result in more justifications for military action in that region. If it turns out that airstrikes are insufficient to seriously degrade ISIS, and you really believe that ISIS is a serious threat to the “homeland” and national security interests, then how could you justify opposing anything needed to defeat them up to and including ground troops? No doubt Australia’s participation in the last Iraq war will substantially increased the threat of homegrown terrorism to the country as well as encouraging, rather than discouraging, radicalized individuals to pour into Syria and Iraq to boost the IS numbers. It is hard to look at U.S. actions in the Middle East and still accept that the goal of its military deployments is humanitarianism. The U.S. government does not oppose tyranny and violent oppression in the Middle East. To the contrary, recent history indicates that it is and long has been American policy to do everything possible to subjugate the populations of that region with brutal force. Humanitarianism is the cover for blowing things and people up with bombs. America needs it's evil villains. Each one is worse than Hitler. The US government has an overt, explicit policy of “regime continuity” for Saudi Arabia, and it o continues to lend all sorts of support to the military dictators of Egypt. The foreign policy is not driven by a humanitarian mission in the Middle East. There has been a on a long era of US warfare. This looks to be the Third Iraq War. What has 13 years of US war in Iraq durably achieved? Chaos and the disintegration of nation states. Despite the US intelligence agencies concluding that IS poses no immediate threat to the United States, the war mongering hawks have hysterics. According the New York Times elected officials and TV talking heads tare spinning the public into a panic, with claims that the nation is honeycombed with sleeper cells, that operatives are streaming across the border into Texas or that the group will soon be spraying Ebola virus on mass transit systems — all on the basis of no corroborated information. It seems to me that all of this fits in with the scenario described in Orwell's 1984, with the "conservative" media, especially Murdoch/Fox playing the role of the Big Brother propaganda machine, even demonizing those dare to ask real questions. On the other hand we have the situation described in Brave New World with the masses made self-oblivious via the medium of the entertainment-celebrity-complex, with Murdoch/Fox (and the IPA too) telling us that we have never had it so good. It is human nature to make war. Good sense doesn't come into it. There is no imminent terrorist attack in Australia ----Abbott says so. They are jumping at shadows. It's the politics of panic. The terror threat announcements are politically useful to Abbott. We have no way of judging whether this is so because the intelligence assessments are secret; the surveillance is covert and the public can't see the dark corners or know what suspicions are held by the security agencies. We don't know the threats ASIO have identified or the plotters they might be monitoring. The Abbott Government is leveraging the prospect of Australians facing terrorist acts from their own countrymen to justify a range of security initiatives including the mandatory retention of metadata as well as the joint action with the US against IS in Iraq. They are are going hard on this justification. The Abbott Govt says that there will be no commitment of “combat troops on the ground”. But there's mission creep the prime minister is sending 600 military advisers along with eight Royal Australian Air Force F/A18 Super Hornet combat aircraft, an E-7A Wedgetail airborne early warning and control aircraft and a KC-30A tanker and transport aircraft. The Liberals have always been the war party. They've got their war machine rolling on yet another misconceived Middle East adventurism. Australia is going to fight IS in Iraq + Syria which means that it is tacitly supporting the Assad regime in Syria, which IS is fighting. Yet Australia does not recognise the legitimacy of the Assad regime. Australia is intervening in a civil war yet it is not at war according to Abbott. Apparently Australia is only helping national and regional authorities maintain internal security and to “dislodge” Islamic State (Isis) militants. It looks to be little more than Operation Whack-a-Mole against jihadists. How does destroying the Islamic State create an effective and legitimate Iraqi state? It won’t dissuade Saudi Arabia from funding jihadists. It won’t end the Syrian civil war.